Real Salvadorans would probably be offended by my reference to this recipe as Salvadoran coleslaw, but I did get my inspiration from curtido. If you’ve never had pupusas with curtido you need to get down to your local Salvadoran restaurant and find out what you’ve been missing. I’ve never attempted to make pupusas- thick, stuffed corn tortilla-like pastries filled with meat, cheese, beans and lots of other things. 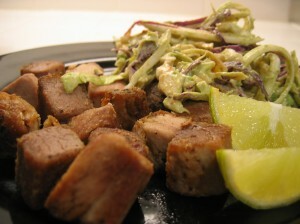 Some day I’ll definitely take a crack at making these Salvadoran staple food and post the results. Blanch the cabbage and carrot in the boiling water for a couple of minutes and then mix with the other ingredients and chill for about 30min before serving. My odd concoction is based on two things, my love for curtido and my recent obsession with coleslaw. 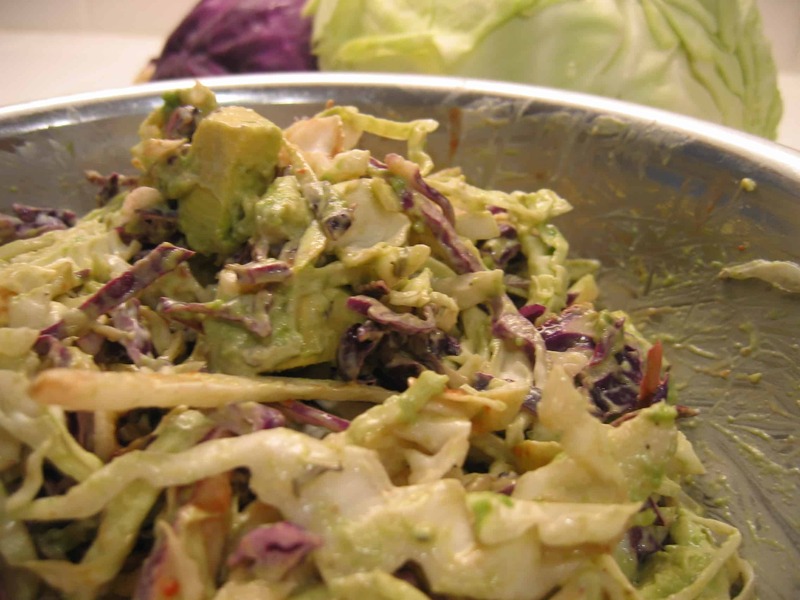 I don’t like most coleslaw recipes because of the heavy sweet and sour taste, but did discover that I love the fresh taste of cabbage dressed with a very small amount of mayo. This recipe combines the vinegar and oregano of curtido along with a little mayo and a nice ripe avocado. It had a nice crunch from the cabbage but with a nice creaminess from the mayo and avocado. I served this with the last of the pork from a shoulder I roasted in the crockpot. I bet that pork would have been even better stuffed into some handmade pupusas, but that will have to wait for another day.